Courtesy photo James Wallis, a.k.a. Lyrics Born, will perform at Whiskey Jacques’ in Ketchum this weekend. The urban sound of hip-hop is coming to the Wild West this weekend. Berkeley, Calif., musical legend Lyrics Born will headline a three-act show at Whiskey Jacques' in Ketchum on Thursday, Oct. 28. Jason Wallis, aka Lyrics Born, has just released his third solo effort, "AS U Were," and will be touring with Chali 2na of Jurassic 5 and Rakaa of Dilated Peoples. 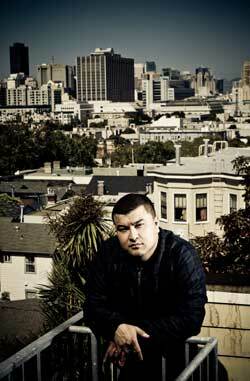 The San Francisco Examiner newspaper describes Lyrics Born as an "indie music champion" in the hip-hop world of rap poetry and driving rhythms. The artist will be performing new material recorded since 2008's "Everywhere at Once." The album will be his first release with New York's Decon records and features production from Jake One and Trackademics. Lyric Born's new CD is said to be introspective and humorous. "Hip-hop purists are not left out in the cold," wrote Kimberley Turner of the Examiner last week. "Lyrics Born goes hard on 'Oh Baby,' rhyming over a snare drum so funky it would make James Brown get up offa his thing." With a career spanning over a decade, Lyrics Born has turned out solo hits and performed as a member of Latryx with fellow emcee Lateef. He's the co-founder of Quannum records, the label he created with DJ Shadow, Gift of Gab and Lateef. Back-up bands Chali 2na and Rakaa are both touring behind dynamic new albums on the Decon label. Chali 2na released "Fish Market Part 2" over the summer, while Rakaa released his first solo album, "Crown of Thorns." Doors open at 9 p.m., music starts at 9:30 p.m.